Summer means hot and humid weather and sun spots on your skin. If you are prone to sunspots, don’t worry. There are many ways to treat this problem and you can enjoy your summer as you do any other seasons of the year. 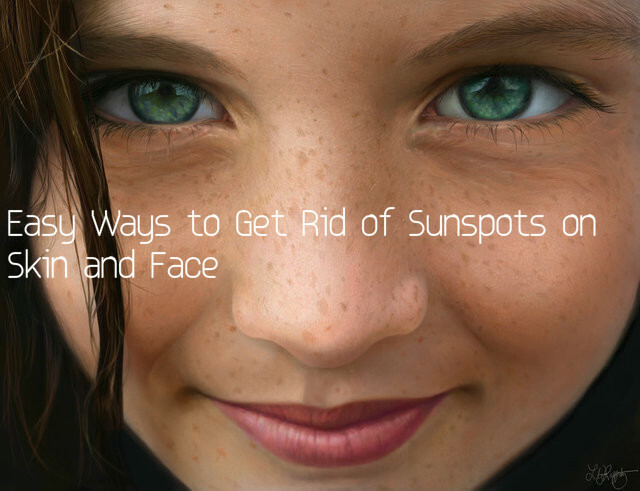 What are Sunspots – Natural Ways to Get Rid of Them? You get sunspots when you skin gets exposed to the harsh ultra violet rays of the sun. When you spend long hours in the sun, your skin suffers from sunspots. Sunspots do not have a particular color or shape. It can appear on any part of the body that is exposed to sun. You get sunspots on your nose, cheeks, lips, arms, ears, hands, neck and so on. They may appear as flat spots or scaly. Below are some ingredients that help you to get rid sunspots in a natural way. Aloe Vera is great for the skin that is damaged with the rays of the sun. Apply fresh aloe vera gel or its juice on the affected area and wait for half an hour. Wash off with plain water. Take equal quantities of apple cider vinegar, water and honey and mix well. Apply this on the area you have sunspots. Wait for ten minutes and then wash with water. Applying this daily will provide you good results. Butter milk is a natural remedy for removing brown spots and other skin problems. All you have to do is to dip a cotton ball into the butter milk and apply it on the skin where you have sunspots. Do this two times daily and you are sure to get rid of the brown spots. Castor oil is excellent for keeping your skin well hydrated and to remove sunspots and tan. Take a cotton ball and dip it in to castor oil. Apply this on the areas you have sunspots and massage well. Wait for one hour to let the skin absorb the oil completely. Doing this two times daily will help in reducing sunspots. Green tea is a store house of antioxidants and excellent for your skin. Place cold green tea bags on the area containing sunspots and wait for a few minutes. You can also squeeze the tea bag into a cotton ball and then rub it over the sunspots. The bleaching property of lemon helps in reducing sunspots on your skin and provides you a flawless skin. To get rid of sunspots, take a fresh lemon and squeeze it to get its juice. Apply this juice on the area that is affected and wait for half an hour. Wash off with cold water. Using this regularly for a couple of weeks will reduce the sunspots on your skin. You can make your own DIY lemon and sugar scrub to get rid of brown spots. Mix both the ingredients and apply on the brown spots. Rub on the spots gently. Wash off after 10 minutes. By using this regularly for three weeks you can reduce the brown spots on your skin. If you already have a tanned skin, try to avoid going out in the sun. If you have to go out, never forget to carry an umbrella with you. You must also take care not to wear any dark colored or bright clothes. The clothes you wear should be loose fitting and simple. It is also recommended that you wear your sunglasses. This will protect your eyes. When you are going to spend time in the beach, wear a hat. Sandalwood is good for getting rid of dull skin and pigmentation. It is also excellent for preventing aging of the skin. Mix sandalwood and olive oil and massage this mixture on the area affected with sunspots. With regular use you can see the change it makes to your skin. It is best when you apply it at night. Anti-tan facials can help you to get rid of sunspots and pigmentations. Chemical peel facials are also very effective for removing tan and sunspots. You must have it done by a professional or an experienced dermatologist. Your skin may be red for one or two days after the chemical peel. Using a sunscreen is a must when you go out in the sun. This will protect your skin from the UV rays of the sun and also prevents premature aging of the skin. The sunscreen you buy must have an SPF of 30 or above. This will ensure that your skin gets full protection from the sun. In India sunscreens with SPF 40 may be needed. You can also make a pack by mixing sandalwood powder, lemon juice and rose water, and apply this on the affected area. Wash with cold water. Take some fullers earth and mix it with rose water and aloe vera gel. Apply this on the area damaged by the sun and wait for about 15 to 20 minutes. Wash with cold water. Use this three to four times a week. Besan is great for various skin problems. Mix besan with lemon, milk, some turmeric and rose water to get a smooth paste. Apply this on the affected area. Let it dry and then wash with water. This can help in removing tan and sunspots. Take one half of a cucumber and mix it with sour curd. Apply this on the area of the skin where you have sunspots. Wait for a few minutes and then scrub it off and wash with cold water. If you have sunspots on your sin, apply coconut water on the affected area. This will help in getting rid of them with regular use. Mash papaya to get its pulp. Apply this on the affected area and wash off with cold water after a few minutes. Using this regularly will help you get rid of sunspots and tan.